The RANCH’s Thai Dragon Mule, Our Drink Of The Week! Rarely does a restaurant serve both a satisfying meal and legitimate cocktails. But that ain’t the case at The RANCH in Anaheim. Better known for an elaborate wine collection, the bartenders continue to step up their game with experimental infused liquors and ingredients straight from their expansive farm in Orange Park Acres. And you don’t have to step inside The SALOON to order their fine Thai Dragon Mule; their cozy bar straddles the two main dining rooms. Ask, and you’ll learn the inspiration for it was actual Thai basil grown on Edwards Ranch Estates, the farm of RANCH owner Andrew Edwards. Asian inspiration continues with Purity Vodka infused with Chinese five spice. Instead of lime, you’ll find fresh yuzu juice. To finish, ginger beer by Fever Tree. 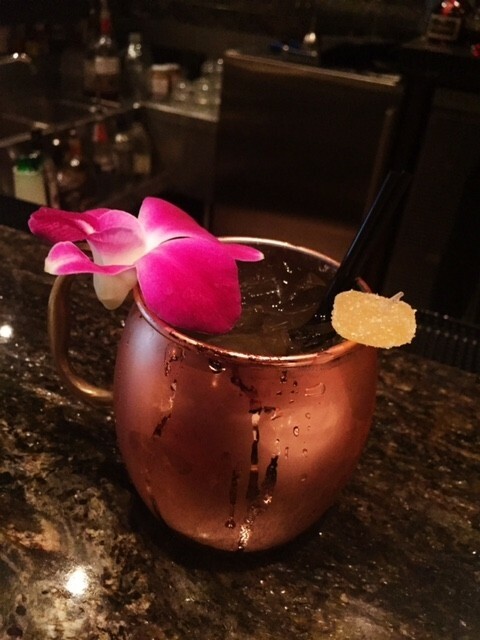 And just admit it— there’s something about a drink served in fancy copper mugs that gets many a drinker wishing they were a part-time kleptomaniac (note: don’t be a douche). You’ll discover a subtle bite to your drink, but it’s refreshing; you look as cool as the other side of the pillow. Cheers! A contributing writer for OC Weekly, Anne Marie freelances for multiple online and print publications, and guest judges for culinary competitions. A Bay Area transplant, she graduated with a degree in Hospitality Management from Cal Poly Pomona. Find her on Instagram as brekkiefan.